We present some background notes on the variation in the Scotch Game played twice by Kasparov against Karpov in the 1990 world championship match. In particular, it will be shown how, 110 years ago, the same line was part of a bitter analytical dispute between the world’s leading active players, Steinitz and Zukertort. Tarrasch (in The Game of Chess) approved of 6...Qe7, but earlier master comment had been negative. In the English-language book of the Hastings, 1895 tournament, Albin said that it was ‘not good’, the usual continuation being 6...Nd5 (a move which Tarrasch considered unsatisfactory). In The Modern Chess Instructor, published in 1889, Steinitz had given 6...Qe7 a question mark, with the following analysis: 7 Qe2 Nd5 8 c4 Ba6 9 f4 O-O-O 10 Qf2 Qb4+ (or 10...Nb6 11 c5 Bxf1 12 cxb6 Ba6 13 bxc7, with the better game) 11 Bd2 Qxb2 12 cxd5 Bxf1 13 Qxf1 Qxa1 (or 13...Kb7 14 Bc3 Bb4 15 Bxb4, with advantage) 14 Qa6+ Kb8 15 Ke2 Qb2 16 Nc3, with the better game. Another Steinitz line was 9...Qb4+ 10 Kd1 Nb6 11 b3 Nc8 12 Bd2 Qb6 13 Nc3 Be7 14 Qh5, again with the better game for White. Several commentators have called this the ‘Mieses Variation’ apparently because Jacques Mieses occasionally adopted it in the 1890s. 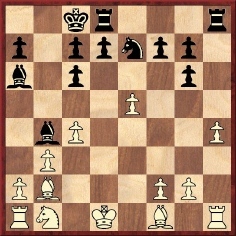 But, as will be seen below, Blackburne used it twice against Zukertort in match play in 1881, at which time Mieses’ chess career had barely begun. Tarrasch (op. cit.) said that 8 c4 was bad because of 8...Ba6 9 f4 Qb4+ 10 Kd1 (if 10 Qd2 Nxf4) 10...Bc5, after which one possibility, he said, would be 11 a3 Qb3+ 12 Qc2 Ne3+ 13 Bxe3 Qxe3 14 Qd2 d6 15 exd6 O-O-O, ‘and Black has the far superior game’. Instead of 8 c4, Tarrasch recommended 8 Nd2 Bb7 9 Nb3 O-O-O 10 c4 Nb6 11 Bd2 Re8 12 f4 f6, ‘and Black has the superiority in the centre’. An attack by 13 a4 would be beaten back by 13...Ba6 14 Qe4 Qf7 15 c5 Bxf1 16 cxb6 axb6 17 a5 b5. ‘All these variations are exceptionally trenchant and lively.’ Up to 16.cxb6 this was the tenth match game Mieses v Tarrasch, Berlin, 1916. 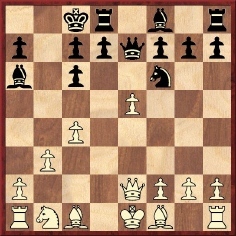 Tarrasch played the inferior 16...Qxb3. 8 Nd2 was the move chosen by Blackburne in a blindfold simultaneous game against Piper in London in October 1881 (Chess Monthly, June 1882, pages 306-307). Play continued: 8...g6 (as good as 8...a5, said the magazine) 9 Nf3 Bg7 10 a3 (‘White dare not play 10 Bg5 at once, for Black would win with 10...Qb4+ at least a pawn’) 10...a5 11 Bg5 Qe6 12 c4 Nb6 13 Bf4 Ba6, and Black eventually won (at move 40). In the same tournament book, Schiffers called 8 f4 ‘good continuation here’. Mieses v Forgács, Ostend, 1907 went 8 f4 f6 9 c4 Ba6 10 b3 fxe5 11 fxe5 O-O-O 12 Bb2 Qg5 13 Nd2 Bb4 14 Bd4 Rde8 15 a3 Rxe5 16 Bxe5 Bxd2+ 17 Kd1 Bc3 18 Rc1 Bxe5 19 Qf2 Ne3+ 20 Ke2 Bd4 21 Qf3 Bb7 22 Qg3 Qe7 23 Kd3 c5 24 Kd2 Nf5 25 Qh3 Be3+ 26 White resigns. Karpov’s choice in the 14th game, 1990. The match book by Kasparov, Geller, Lein and Chepizhny says (page 100) that Karpov’s choice in the 16th game, 8...Nb6, ‘is not new, and had already occurred in tournament play’. That is quite an understatement, given that 8...Nb6 even appeared in Bilguer’s Handbuch in the nineteenth century. It offered the variation 8...Nb6 9 Bf4 Ba6 10 Nd2 Qb4 11 O-O-O Rb8 12 a3 Qa4, which prompted the Chess Monthly to observe that ‘some of the moves for White show more valour than discretion’. 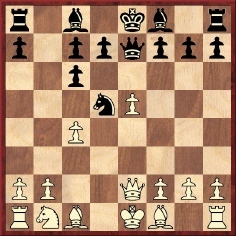 Another line: 8...Qb4+ 9 Nd2 Nf4 10 Qe4 Ne6 11 f4 Bb7 12 a3 Qb6 13 Nf3 c5 (Walbrodt v Marco, Hastings, 1895, a 58-move draw). In the English-language tournament book, Schiffers said that 9 Kd1 was preferable. A modern instance of Marco’s line of development (except that Marco castled on the king’s side) was praised as ‘quite a neat concept’ by Miles on page 5 of Inside Chess, 29 December 1990. For 9 f4, see Schiffers’ notes to the correspondence game Chardin v Schiffers, given on page 252 of the English edition of the Hastings, 1895 tournament book. Also Deutsches Wochenschach, 1895, page 83. Various spellings of Chardin’s name are to be found. In his 14th match game against Karpov at Lyon in 1990, Kasparov played 10 g3 now, and this caused players with the black pieces to examine other choices at move nine (9…Qh4, 9…g6 and 9…g5). Here we continue with the old line. 10 Bb2 was also played in the 14th game of a match in London between Blackburne and Zukertort in 1881, a match which Zukertort won with a score of +7 –2 =5. Steinitz’s annotations in The Field were strongly criticized by his enemies Zukertort and Hoffer, who were the joint editors of the Chess Monthly. An acrimonious analytical controversy on the complete set of 14 match games took up countless pages of these and other journals. Steinitz wrote that 11 h4 would be better because if 11...Bb4+ then 12 Kd1 Qg6 13 Qc2 with advantage. The Chess Monthly gave 11 h4 Qg6! [In his game against Unzicker in the 1983/84 Bundesliga, Hort improved substantially on White’s play with 11 Nbd2 (Gutman).]. 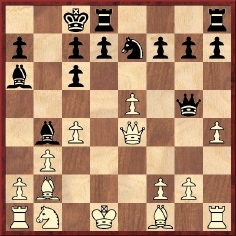 The Chess Monthly calls this the only move, parrying the threatened 13...d5. It regards 13 f4 as far inferior because of 13...d5 14 cxd5 Qg4+ 15 Qf3 Qxf3+ (and not 15...Rxd5+ 16 Kc2, winning a piece) 16 gxf3 Bxf1 17 Rxf1 Nxd5. Steinitz says that this is best since the queen would have stood badly at h6, allowing White to gain time for development with 14 Kc2, which prevents 14...d5 because of 15 exd6 Rxd6 16 c5. The Chess Monthly notes the variation 13...d5 14 cxd5 Qh5+ 15 g4 Rxd5+ 16 Kc2 and wins. 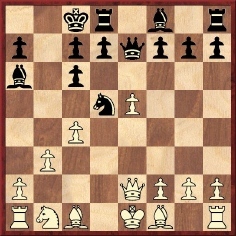 Steinitz describes this as unnecessary and prefers 15 Bd3, guarding against the knight’s entry at f5. If then 15...d5, White can play 16 exd6, followed by 17 Kc2 and 18 Rd1. 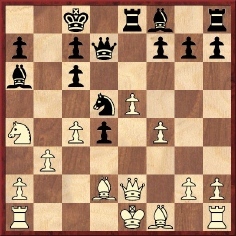 The Chess Monthly says that the reply to 15 Bd3 would have been 15...g5. 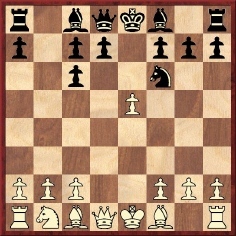 In the above position another move instead of Kasparov’s 10 g3 is 10 Qe4, as had been played by Blackburne in his 12th match game against Zukertort. In The Field, Steinitz called it an unwise trap and probably an attempt to induce Black to play 10...Nb4 11 a3 d5 12 Qf5+. He recommended 10 Bb2 or 10 Qb2, but not 10 Ba3 because of 10...Qxa3 11 Nxa3 Bb4+, and White’s queen must interpose to avoid the loss of a piece by 12...Nc3+. As regards 10 Qb2, Steinitz gave the following ‘likely continuation’: 10...Nb6 11 c5 Bxf1 12 cxb6 Bxg2 13 bxa7 Kb7 14 Rg1 Bd5 15 Be3, ‘and the pawn at a7 will be somewhat troublesome in the middle game, though for the ending it, no doubt, stands weak. But then, even if Black wins this pawn, he will only have a doubled pawn plus in the queen centre, while White will remain with a passed pawn on the a-file. On the whole, we are, however, inclined to pronounce in favour of the move in the text (10 Bb2), which seems to leave more initiative to the first player’. In reply, the Chess Monthly expressed preference for 10 Bb2, believing that 10 Qb2 was ‘very inferior’. The magazine gave the following analysis: 10 Qb2 Nb6 11 Be2 (or 11 c5 Bxf1 12 cxb6 Bxg2 13 bxa7 Kb7 14 Rg1 Bd5 15 Be3 Re8 (or 15...Qh4, winning the h-pawn – [Gutman gives 15 Be3 d6!]) 16 f4 f6 17 Bd4 fxe5 18 fxe5 c5 19 Bc3 Bc6 20 Na3 (if 20 Nd2 then 20...Qh4+ and 21...Qxh2) 20...d5, and Black will remain ultimately two pawns ahead.) 11...Re8 12 f4 (if 12 Bf4 then 12...g5 has much greater effect) 12...g5 13 fxg5 (or 13 g3 gxf4 14 gxf4 Qh4+. If 13 O-O, then 13...gxf4 14 Bxf4 Bg7) 13...Bg7 14 Bf4 Qc5 15 b4 Bxe5 16 Bxe5 Qxe5 17 Qxe5 Rxe5 18 Kf2 Bxc4 19 Bxc4 Nxc4 20 h4 Rhe8 21 Nc3 Nb2 22 a3 d5. Steinitz: 12...d6 would have won a pawn for Black in view of 13 exf6 Qd8 14 Be3 Qxf6. The Chess Monthly concurred, adding: 13 exd6 Qd7 14 Be3 Ng4 and 13 Bb2 Nd7 14 ‘P-B4’ (an impossible move) f6 or 14 exd6? Qd8 15 Be5 cxd6. According to the Chess Monthly, 15...c5, followed by 16...Bb7, would be much better. This 12th match game between Blackburne and Zukertort finished abruptly: 17 O-O-O Qf5 18 Bxb4 Bxb4 19 Bd3 Qd7 20 c5 Bb5 21 Bxb5 Black resigns. The notes by Steinitz and Zukertort/Hoffer to the final moves have been omitted here. Although many of the above Scotch Game variations still occur in modern games, the great labour of these giants from another century seems to have been virtually forgotten.